Dressing up for Halloween at college is a necessity. But the price tags on the costumes at those pop-up Halloween shops can be scarier than all the Halloween movies combined! As a college student, it makes more sense to save your money for more important things, like tuition payments, textbooks, and, you know…candy. Here are some fun ways you can save money on your Halloween costume this year, plus a few ideas to get you inspired for campus shenanigans. 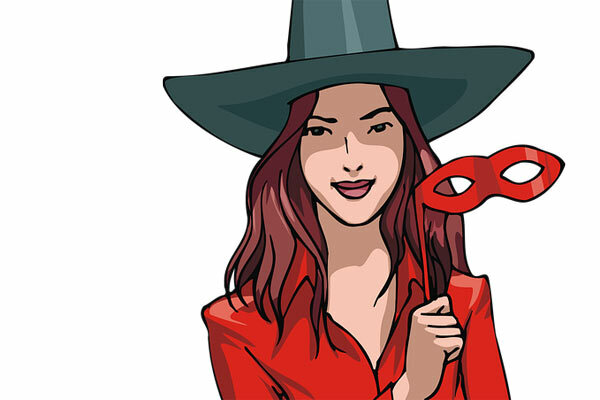 Use inexpensive and everyday items for a cool costume that won’t break the bank. Movie theater floor: Dress in all black, then stick on litter you’d find at the movies—ticket stubs, popcorn, candy boxes, gum wrappers, straws, etc. The costume will only be improved if you spill a drink on yourself. Animal (cat, dog, pig, etc. ): You’ll get an F for originality, but an A+ for frugality. Just buy some ears and a tail at a party store, dress monochromatically, paint on some whiskers, and you’re a mouse…duh! You probably have a few costume elements in your wardrobe already. But if you don’t, a quick stop to Goodwill will complete your look affordably. Where’s Waldo? : All you need is a red and white pom-pom hat; a red and white–striped sweater; jeans; and a pair of thick-rimmed glasses (which you can even draw on or cut out of paper to be extra thrifty). Add a cane if you really want to get into character. Rosie the Riveter: Grab your best chambray shirt, tie up your hair in a red and white bandana (polka dots preferred), and get ready to show off the guns. You can do it! Tourist: A flowered shirt, sunglasses, straw hat, and tropical drink in hand will put you in the mood for spring break. Reuse your formal or prom apparel or thrift a cheap dress or suit for these fancy Halloween costume ideas. Flapper: Throw on some pearls, stick a feather in a headband, and kick up your heels—it’s time to party like it’s 1929! Secret Service agent: Dress in black, wear some dark shades, and try not to break a smile. You can also use your old suit to dress as James Bond, an FBI agent, etc. Prom king or queen: Add a crown or tiara. Then pour some fake blood over your head if you want to go the Carrie route (and don’t mind ruining your clothes). Sim: If you’re good at origami, you can fold a PlumBob (the green icon that floats over a character’s head) and attach it to a headband to instantly become the Sims version of yourself. Pineapple: Create a tall, leafy crown with green poster board and dress head to toe in yellow for this sweet costume. Paper doll: Grab some white poster board; draw a skirt, pants, shirt, hat, bow, purse, etc. ; and be sure to leave some white tabs when you cut them out (like this). Tape them on and you’re ready to play! If your makeup game is strong, you can transform into a bunch of different characters with your own cosmetics or a face paint kit. Classic Halloween casualty (zombie, vampire, etc. ): Lay it on thick with pale makeup, sunken eyes, and lots of fake blood. Pop art: Dress in bright colors or polka dots. Then paint red dots all over your face and outline your facial features with thick, black lines. Pow! You’re straight out of a comic book. Clown: Just kidding! With the recent creepy clown epidemic, we highly suggest you skip the red nose and rainbow face paint this year.